Hi, this is Ricardo. I talk and love new adventures. Hi I am Ricardo! I am a beautiful blue front amazon. I was with the same person for the first 18 years of my life. I even went to Chico State with her! But things changed and she didn`t have time for me when her young family came along. That is OK. I am with Mickaboo fosters now and looking for my new forever home. I love to talk, whistle and hum little tunes. I say "Hello" when the phone rings and "Goodbye" when someone is leaving. I am a bit quirky. I will take a little time to warm up and trust a new family. 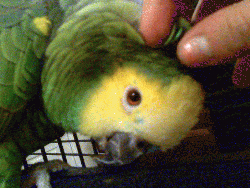 My foster parents think I a very nice bird, but I am just not as "cuddly" as some birds. I do love a nice head scratch now and then! I am pretty quiet for an amazon. I greet the morning and night, but not much more than that. I can`t wait to meet you and to start the next chapter of my life! Maybe a new home for the holidays! I would do best with an experienced bird person.